My reviews of the first eight books in the series: Maisie Dobbs, Birds of a Feather, Pardonable Lies, Messenger of Truth, An Incomplete Revenge, Among the Mad, The Mapping of Love and Death, A Lesson in Secrets. A simple man with an almost miraculous ability to calm horses, Eddie was beloved by nearly everyone in the community where Maisie grew up. When he dies in a suspicious accident in a paper factory, many of the men who knew him are certain that his death was no accident. This is a case that both hits Maisie close to home – much closer than she’s comfortable with, in many ways – and pushes her far beyond her comfort level. At the same time as she is being challenged professionally, Maisie is struggling personally. It becomes increasingly clear that the money left to her by Maurice, and particularly the way she is using is, is beginning to get in the way of her relationships with friends and employees. In addition, Maisie’s romance with James Compton is increasingly rocky, as their vastly different backgrounds and future plans encroach upon their love. It is amazing to say for the 9th book in a series, but Jacqueline Winspear’s Maisie Dobbs books just keep getting better. Maisie has truly come into her own, both as an investigator and as a well-developed character. Her personal struggles, both with her friends and employees and with James are incredibly real, and very much based in the person she is, and the context in which she grew up. Winspear does remind us briefly of Maisie’s first love, Simon, raising the question of whether Maisie’s inability to fully connect with James, as in her previous relationship with Andrew, is really a function of them wanting different things, or if part of it has to do with the psychological wounds she still carries from her time in the war and particularly Simon’s wounds. Equally engaging, though, is the case Maisie is working in Elegy for Eddie. What begins as an investigation into the death of a sweet but simple man ends up pulling Maisie in directions she didn’t expect. This case goes much higher up in British society and politics than one would guess from first glance. It is also the most morally ambiguous case Maisie has taken on yet, at multiple levels are people whose attempts to do what they believe is right damage the life of those around them. 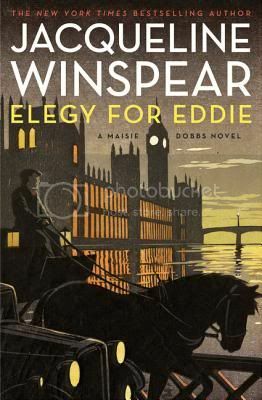 The Maisie Dobbs novels, including Elegy for Eddie are superb examples of historical fiction firmly grounded in the time period in which they are set, but they are also intriguing mysteries and thoughtful, character-driven novels. I’m not really sure what more a reader could ask for. Very highly recommended. This tour also included reviews of the earlier books in the series. The full list can be found at TLC Book Tours. I sort of gave up on this series after not really loving the mystery aspects of the first book. It seems like this series gets better and better with each book, and from a lot of the reviews I have read, the majority of bloggers seem to love this series. I think perhaps I need to try again. Butting in here, but I also did not really enjoy the first book. It took me over a year to try the second book and then the series sort of took off for me. I really think with this series you should really try book 2 before writing it off entirely. That’s just my opinion, though. Hopefully this book is in my mailbox! I loved this one. I’m always amazed at Winspears ability to give us a good mystery and a great character study in Maisie as well. I’m reviewing it tomorrow (not for a tour). My only sadness is now I have to wait for the next book. Thanks goodness for Bess Crawford. I am so anxious to read this one, but I’m really nervous about the way her relationship with James plays out. I feel like there have been several attempts at healing her wounds, and that none has really “taken.” While I understand that, I wish there was a bit more growth in her character instead of struggling with the same problems each time. BUT – I really love these books and am curious as to the actual mystery here. As Martha says – Thank goodness for Bess. I can’t wait to read this! I love this series. I agree with Jenn – the picky girl though…..I wish Maisie was allowed to heal. This right here: “I’m not really sure what more a reader could ask for” is about the best compliment I’ve heard for a book! So glad you enjoyed this one. Thanks for being on the tour. I love the series, though I must say this isn’t my favorite book so far. I understand Maisie has issues and those issues flare up sometimes, but I just felt she was filled with a little too much angst. I’m hoping she has calmed down again by the next book.